Fostoria American Muffin Tray with handles is in mint condition. It measures about 10" end to end. Fostoria produced this pattern from 1915 til 1981. Fostoria American 12" Oval Platter is in mint condition. Fostoria produced this pattern from 1915 til 1981. 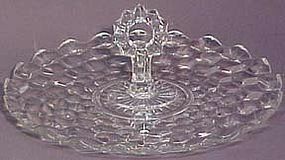 Fostoria American Platter, 13" x 9" is in mint condition. Made from 1915-1986. This is Fostoria's American pattern. 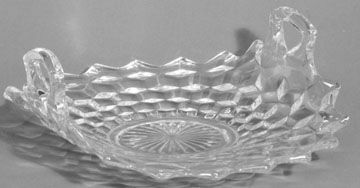 A tabbed 8.5" relish oval bowl. Bottom is NOT ground. It is in excellent condition. Produced from 1915-81. Two are available. Fostoria made the American pattern from 1915-1980. 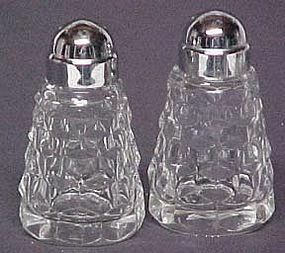 These Shakers are in mint condition (3.5" tall). 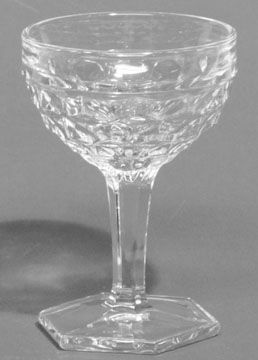 Fostoria American Tall Sherbet Goblet, 4.75"
Fostoria American tall Sherbet Goblet, 4.75" tall, is in mint condition. Eight stems are available. Fostoria produced this pattern from 1915 til 1981. Fostoria made the American pattern from 1915-1980. 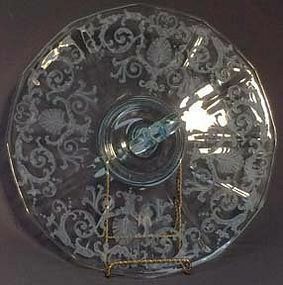 This handled tort/sandwich tray measures about 11.5" across. In mint condition. 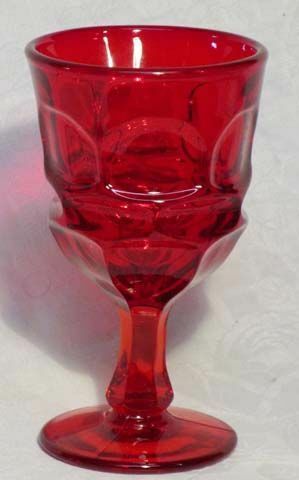 Fostoria Argus Red Water Goblet, 7", 10 oz. 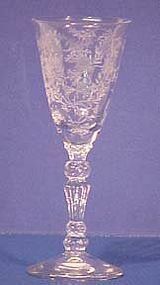 Fostoria made the etching Versailles from 1928-44. This azure blue handled tort is 11.5" across and in excellent condition. 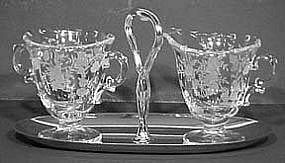 Fostoria Bouquet etched Creamer & Sugar with chrome plated tray is on the Century blank pattern. 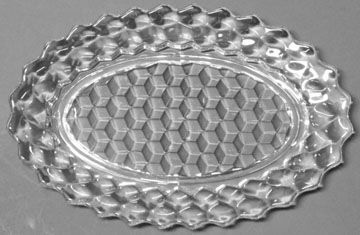 The pattern was made from 1949-1960. This 3-piece set is in mint condition. Fostoria made the Camelia etching from 1952-65 on the Century blank. 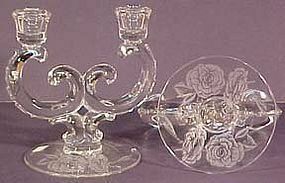 A pair in excellent condition standing 6.75" tall and 7" at their widest. Fostoria Century (blank) was produced from 1949-86. 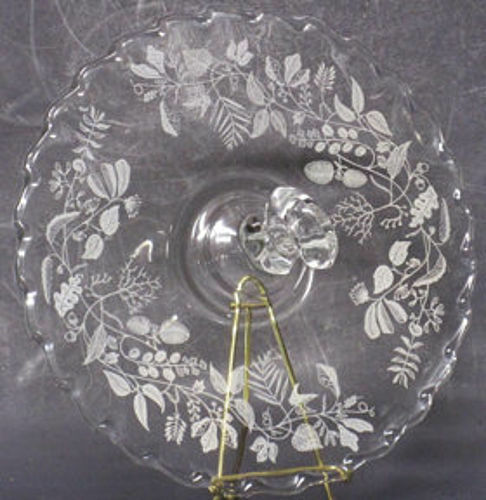 This sandwich platter with center handle is etched with the "Leaves" etching. In excellent condition. 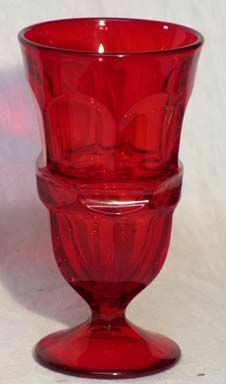 Fostoria Century was produced from 1949-86. It is 4.25" tall and holds 5.5 oz. Four available and are in excellent condition. Fostoria Chintz Etched 12" Bowl, round and flared. In excellent condition and produced from 1940-1976. 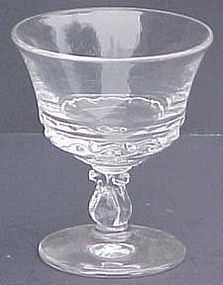 Fostoria cordials with the Chintz etching are 4" tall and hard to find. 3 are available, each in mint condition. Made from 1940-1976. 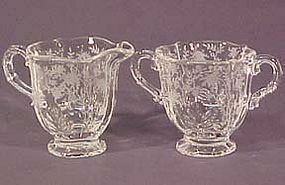 Fostoria made the Chintz etching from 1940-1976. Both in excellent condition.